New Rochelle, April 16, 2018–FraudBuster is a new data-driven approach designed to help insurers in high fraud rate markets, such as the automobile insurance market, proactively identify risk and reduce fraud. The unique design and deployment of FraudBuster is described in an article in Big Data, a peer-reviewed journal from Mary Ann Liebert, Inc., publishers. The article is part of a special issue of the journal on Profit-Driven Analytics and is available free on the Big Data website through May 16, 2018. 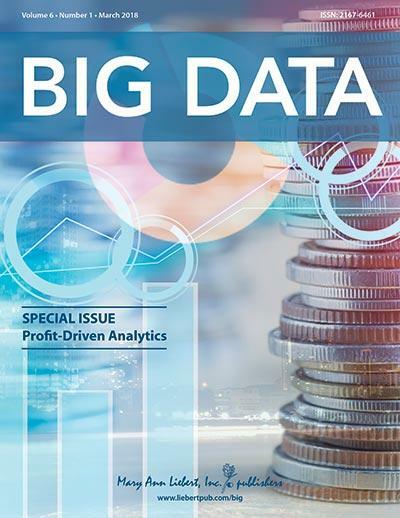 The Special Issue on Profit-Driven Analytics was led by Guest Editors Bart Baesens (KU Leuven, Belgium), Wouter Verbeke (Vrije Universiteit Brussel, Belgium), and Cristián Bravo (University of Southampton, U.K.). In the article entitled "FraudBuster: Reducing Fraud in an Auto Insurance Market," Saurabh Nagrecha, Reid Johnson and Nitesh Chawla, University of Notre Dame, IN, described how their novel approach focused on proactively predicting bad risks at the underwriting stage, rather than waiting until a claim is filed to identify fraud. The authors showed that while FraudBuster cannot predict which drivers are likely to get into an accident and commit fraud, it can help identify drivers that are unprofitable and are likely to be fraudulent risks. The special issue also features the article "A Literature Survey and Experimental Evaluation of the State-of-the-Art in Uplift Modeling; A Stepping Stone Toward the Development of Prescriptive Analytics," by Floris Devriendt and Wouter Verbeke, Vrije Universiteit Brussel and Darie Moldovan, Babe?-Bolyai University, Cluj-Napoca, Romania. In this article the researchers provide an extensive comparative overview of the different approaches to uplift modeling. They perform an experimental evaluation of four real-world data sets to demonstrate the advantages and limitations of different uplift models, which are used to estimate the effect of a strategy, such as a direct marketing campaign, on the outcome based on identified control variables.